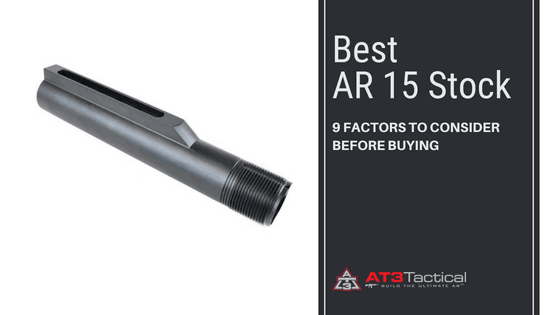 Home / AT3 Tactical AR Academy / Mil Spec vs. Commercial AR 15 Buffer Tubes – Which One is Better? Mil Spec vs. Commercial AR 15 Buffer Tubes – Which One is Better? This is one of the most common questions we are asked, and for good reason. If you are interested in upgrading your AR-15 stock, or planning to build an AR, it is critical to understand the subtle differences between mil spec and commercial AR 15 buffer tubes two very similar standards. The AR-15 buffer tube (also known as the receiver extension), is the metal protrusion that sticks out of the rifle and serves two functions: it houses the recoil buffer mechanism, and it serves as the attachment point for the buttstock. The reason it’s referred to as a “buffer tube” is because inside the tube is a large spring (called the action spring), and a weighted part known as the “recoil buffer”. More info: When the rifle is “cocked” using the charging handle, the action spring is what makes the bolt slide back forward. Also, after a round is fired, the action spring is what pushed the bolt back forward and chambers the next round. The recoil buffer sits inside of the spring, and its weight provides some “buffer” against the forces of recoil. By changing the weight of the buffer, you can change the characteristics of how the rifle cycles. Now that you know what’s going on inside the tube, let’s examine the difference in types. The most critical difference is the diameter of the area where the stock slides onto the tube. The mil spec buffer tube is about two hundredths of an inch smaller than commercial. This may not sound like much, but it’s enough that buttstocks designed for one standard will not be compatible with the other. There are other differences that people will point out, such as the angle of the back of the tube, or the type of metal used. The problem is – these traits can vary by manufacturer, and are not necessarily related to the diameter of the tube. I’m looking to buy a new buttstock. How can I tell which size I need? As we mentioned above – you need to match the stock to the buffer tube. Most stocks come in both mil-spec and commercial varieties. The best way to measure is by using a micrometer, and measuring the diameter of the tube. A mil-spec tube should measure about 1.146”, and a commercial will be about 1.17”. Why do 2 different standards exist? As with so many things – it all comes down to money. The mil-spec buffer tubes were the original design, but the manufacturing processes of commercial spec buffer tubes provide a lower cost. More info: When the M4 was first introduced as a military weapon, there was only 1 type of tube – mil spec. But as the M4-pattern rifles moved into the civilian ranks, companies realized that they could make the tube cheaper. By making the tube a touch larger in diameter, the threads could be cut in, vs the mil spec tube where the threads are rolled in. So which one is better – Mil Spec or Commercial? First off – we cannot find any scientific evidence supporting that one standard is noticeably “better” than the other on strength, performance, etc. But we recommend using a mil-spec buffer tube. Why? Even though it costs a little more, there are more options for aftermarket stock upgrades, and many people believe that the part is slightly stronger (again, this lacks the scientific proof we would like to see). More info: We see increasing movement toward this becoming the “standard”, in spite of the fact that it tends to costs more. No doubt, the fact that the military favors this standard is a big part of this. For instance, Magpul recently reduced the number of commercial spec stocks that it offers, and now only offers most commercial stocks in black. If the difference in tube size is actully about .020″. then the 1st comment is true. Otherwise the difference would be .054″. You ask for proof for one over the other. Threads, especially on such a thin walled tube. Another comment regarding strength, Mil-Spec buffer tubes are available in 6063 T6 aluminum alloy and 7073 T6 aluminum alloy. 7073 is roughly twice the strength of 6063, for that reason it’s marketed as Heavy Duty when choosing buffer tubes. A 7073 tube will cost more than a 6063 tube. Commercial buffer tubes only come in 6063 T6 alloy. Whether you’re building or trading out parts, one should ask themselves what level of activity you’re going to engage in, and how muvh potential abuse will the stock receive. If it’s going to be used and potentially abused in the field, go for the heavy duty 7073 tube. If it’s your blanket darling and only fired at the range, then go with the cheaper 6063 tube.